In the torrent of analysis on AOL’s acquisition of Huffington Post, relatively little attention has been given to the fate of Patch, AOL’s ambitious attempt to build a national network of local news sites. I have a dog in this fight: I’m one of the three founder-editors of Berkeleyside, the leading news site for Berkeley, California. So the growth of Patch — and its supposedly imminent expansion to Berkeley — has been something I’ve watched with keen attention. The only concrete remarks I’ve seen on the Patch part of the AOL/HuffPo deal have referred to it as providing “local infrastructure” and to the benefits Huffington’s “reader engagement tools” will bring to the sites. I’m not sure I buy into either theory. I can perhaps see some logic in HuffPo having access to tons of very local journalism when, for instance, there’s a national election. What’s the mood in Walnut Creek? But when Arianna Huffington has spoken in the past about a desire to move into local she has clearly meant building city sites, not sites for towns in the 40,000 to 100,000 population where Patch is active. There are hundreds, perhaps thousands of local online news sites, most of them run by local entrepreneurs, bootstrapping their way to sustainability (I avoid the term hyperlocal because it’s meaningless to most people). They get virtually no attention from most media observers. When attention is paid to what’s happening in local journalism the focus is on well funded ventures like Bay Citizen (Berkeleyside partners with Bay Citizen) or experiments by The New York Times and others. Those are the places, crucially, where the best journalism is being done as well. I know we cover Berkeley better than anyone else. We’re wholly dedicated to that task (well, wholly dedicated other than the work all of us need to do outside Berkeleyside to earn a living). We break stories, we engage the community, we’re deeply involved in the crucial debates in our city, we convene important live discussions as well. We write about the best of our city as well as the problems (that last link is not for the squeamish). Our commenters are overwhelmingly civil because they know they are dealing with their neighbors. We’re a source for action as well. We know of two businesses that survived largely because Berkeleyside wrote about them. So isn’t Patch doing the same thing? Not quite, to my mind. There are some individual Patch sites that do a good job (our nearest neighbor, Albany Patch, is one). I have no belief, however, that you can create great or even good local sites out of a production line, no matter how much money you throw at them (Ken Auletta suggested AOL was spending $30 million a quarter on Patch). The constraint for local sites isn’t technical infrastructure or web skills — it’s finding the right people who combine a passion for their town or city with real journalism skills (and I make no distinction between those who come from conventional journalism backgrounds, like the three Berkeleyside founders, and people who have figured it out for themselves by leaping in and doing it). Perhaps I’m old fashioned in thinking this can only happen organically. It’s not something that emerges from a strategic plan. If it did, we’d be creating Anytown-sides all over the place at the moment. We’re constrained by capital, of course, but the bigger constraint is people. We know that Anytownside wouldn’t be as good as Berkeleyside unless we could find people a lot like me and my co-founders. Perhaps it’s easy to look at the media landscape and think local journalism belongs in big national networks. After all, in local papers you have behemoths like Gannett and Newhouse. But the papers inside these corporations were started one by one, just as Berkeleyside and others are being created today. Where I grew up there was a local weekly paper that was part of a network of a half dozen other local papers. It’s a fair guess that before that it was the creation of a lone entrepreneur. After I moved someone did a roll-up of these and other Chicago-area local papers, and that in turn was bought by the Chicago Sun-Times at some point. No one had the delusion they could create dozens or hundreds of local newspapers in one go. I know our bet is that real journalism wins against “content” (see this excellent analysis of AOL/HuffPo to understand the distinction). I’m happy with that in the long run. There’s also a commercial logic to our approach that I think is very difficult to duplicate at a national or even regional level. Look at the ads on any Patch site. (That’s a trick: there aren’t any on many Patch sites.) We’re doing well with advertisers, although we still have a long way to go. Why is that? Have you ever spoken to a local business owner? Online marketing is not top of their concerns. They are busy running their business, often struggling to survive in a punishing economy. So our job as a fellow local business is to help them understand just what marketing on the web is all about, a patient task of education. We often have to design their ad. We have to work with them one at a time. That’s only going to happen at an intensely local level. If and when Patch launches in Berkeley I’ll welcome it. I’m in favor of more news providers rather than fewer. I also believe in the benefits of competition. 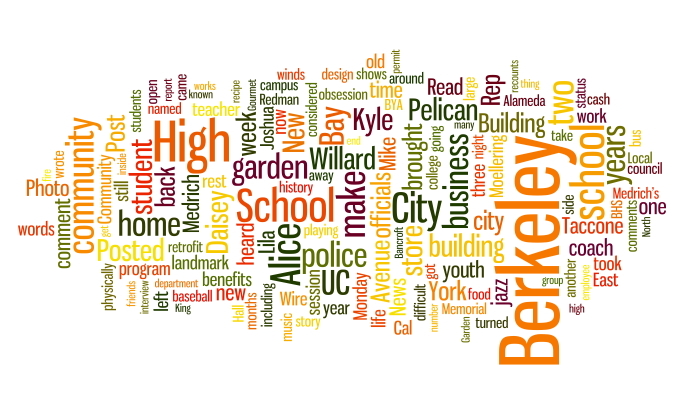 I can crow about how good Berkeleyside is, but we can certainly improve. A competitor will push us. But in the battle between the truly local and the big corporate giants I think we local yokels have all the crucial assets on our side. This entry was posted in Uncategorized on February 8, 2011 by lance. Count me among the naive too. Organic is essential. My observation and experience tells me the extent to which a local online only news operator can expand is limited to an area they can impact every day. Patch is moving — already — it appears to a set of features and types of content that all sites seem to be required to produce. The search for scale in local online news is putting the cart before the horse. Now is the time for local sites to find their individual ways to success based on what works for their communities. Maybe in the future, like the newspapers mentioned above, they eventually make sense for someone to buy up and bundle. But I for one kind of hope not. Very insightful. I run a local blog in East Harlem, and couldn’t agree with you more. Organic is essential. The internet provides an inexpensive way to publish news so a chain of local websites such as Patch or YourNews.com is not necessary though I suppose helpful considering our nation is very brand conscious. The biggest challenge of a local website is the same as a local newspaper: new revenue and news reports or ad sales and well-written news stories. Both are in short supply. Well-trained and motivated citizen journalists may be the answer. That’s why we’ve written “Handbook for Citizen Journalists” and formed the National Association of Citizen Journalists.